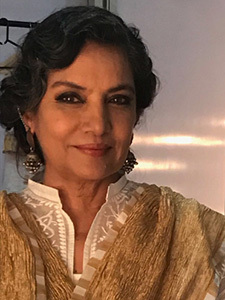 In a career span of 40 years Shabana has played the lead in more than 140 films in Hindi and 12 international films. 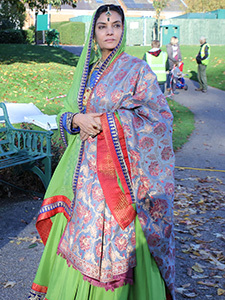 INTERNATIONAL FILMS CREDITS INCLUDE; Fawzia Mirza’s ‘Signature Move’, Deepa Mehta’s ‘Midnights Children’, Mira Nair’s ‘The Reluctant Fundamentalist’, Ben Rekhi’s ‘Waterborne’, Gurinder Chaddha’s ‘It’s A Wonderful After Life’, Ismail Merchant’s ‘Side Streets’, Deepa Metha’s ‘Fire’, Ismail Merchant’s ‘In Custody’, Blake Edward’s ‘Son of Pink Panther’, Jameel Dehlavi’s ‘Immaculate Conception’ co-staring Melissa Leo & James Wilby, Roland Joffe’s ‘City of Joy’ co-starring Patrick Swayze, John Schlesinger’s ‘Madame Sousatzka’ co-starring Shirley McLaine, Nicholas Klotz’s ‘La Nuit Bengali’, co-staring John Hurt and Huge Grant. INDIAN FILM CREDITS INCLUDE; Satyajit Ray’s - Shatranj Ke Khiladi, Satyajit Ray’s - Shatranj Ke Khiladi, Shyam Benegal’s - Mandi, Junoon, Nishant, Ankur, Mrinal Sen’s - Genesis and Khandar, Goutam Ghoses - Paar, Aparna Sen’s -15 Park Avenue and Sati, Shekhar Kapur’s - Masoom. RECENT RELEASES UNCLUDE; Dhruv Panjuani’s ‘Idgah’ 2016 ( To be released), Ram Madhwani’s ‘Neerja’ 2016, Jayant Gilatar’s ‘Chalk N Duster’ 2016, Sanjay Gupta’s ‘ Jazbaa’ 2015. THEATRE CREDITS INCLUDE; Tejpal in Pravesh Kumar’s Happy Birthday Sunita for Rifco Arts, Manjula & Malini in Alyque Padamsee’s Broken Images for Ace Productions, Shaukat in Kaifi Aur Main for Indian People’s Theatre Association, Emma in Harold Pinter’s Betrayal for Singapore Repertory Theatre, Lead in Tanika Gupta’s The Waiting Room for The National Theatre London, Nora in Ibsen’s The Dolls House for Singapore Repertory Theatre, Grusha in Urdu adaptation of Bertolt Brecht’s The Caucasian Chalk Circle for IPTA, Amrita in Urdu adaptation of A.R.Gurney’s Love Letters, TELEVISION CREDITS INCLUDE: Mrs. Kamal in John Lanchester’s Capital a TV serial for BBC/Kudos, Sofia in Hettie Macdonald’s Banglatown Banquet for BBC, Samira in Jamil Dehlavi’s Immaculate Conception for Channel 4 and currently Mrs Shirani, Series Lead in Guiding Light, a six x 1 hour series for ITV. 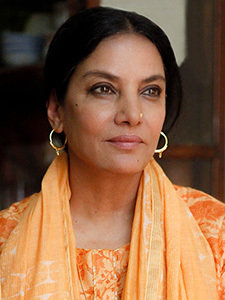 Shabana is the recipient of the Gandhi International Peace Prize 2006, the first Indian to receive this prestigious award at the House of Lords in London. She received the prestigious Crystal Award at the World Economic Forum – Davos 2006 for achieving outstanding excellence in the field of culture and having used art to reach out to other cultures. She is the recipient of the International Human Rights award presented by President Mitterand in Paris in 1989 along with Mother Theresa. She is also a committed social activist having relentlessly worked for the rights of slum dwellers, the empowerment of women and the girl child. She has been Goodwill Ambassador for UNFPA on Population and Development and SAARC countries on HIV and Aids. 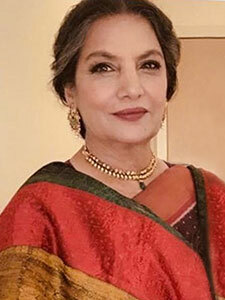 Shabana is a former Member of Parliament and recipient of the prestigious Padma Bhushan. 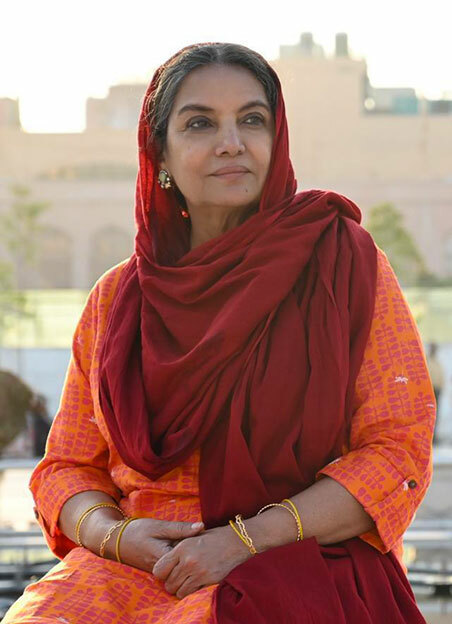 Shabana believes ‘Art should be used as a medium for social change’. She is married to India’s best known script writer and lyricist Javed Akhtar.